The back jacket promises "full fidelity," which would normally be a good thing, but not when the label is Royale. 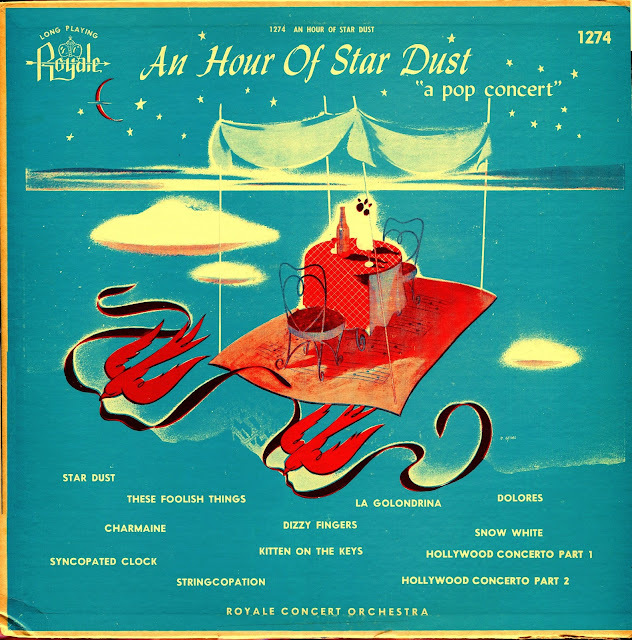 Royale, of course, was a member of the Record Corporation of America's stable of ultra-cheap labels, and An Hour of Star Dust is one of the least competently recorded and engineered fake-RCA releases of all--a horrifying charge, but true. It also contains some of the funnest music anywhere in the company's catalog, so there's that. By the way, I wrote "fake-RCA" to distinguish RCA from, for instance, RCA. Did I say incompetently engineered? Well, on top of the substandard (but full!) fidelity, we have the loud sound of a machine turning on and off between the tracks--a noise I graciously eliminated for you (am I a great guy or what?). Where these recordings came from, I can't venture to guess--radio broadcasts, maybe? I'm picturing a hand-held microphone, a tape recorder, and a radio. That would explain the extremely low fidelity here. Have I insulted the sound sufficiently? Probably not. But, as I noted, this is highly fun stuff, and it's one heck of a cheap-label relic. Note that Hollywood Concerto is actually a male chorus singing sea songs. Possibly Royale had intended to include something by that name (Hollywood Concerto) but their clerk grabbed the wrong masters or something. Not worth puzzling over. It was just the RCA (not to be confused with RCA) way. A male chorus singing sea songs under the title "Hollywood Concerto" is the most Royale thing imaginable. I agree with Buster on the Hollywood Concerto. As a child and young adult I was fortunate enough to visit Disneyland many, many times. The Pirates of the Caribbean was definitely the best attraction in the park and the hour to an hour and a half wait certified that. Once inside the pavilion the strains of(Yo-ho) "A Pirates Life for Me" were heard over the speakers. As children we had no idea who was singing the song but it was ingrained in our memories, completely. Later I found that the singers were Thurl Ravenscroft (Tony the Tiger) and the Mellowmen. If any song was ever to hold the record for the most times played it would be that song and "It's a Small World"
Thurl had a website dedicated to his work with the Barbershop Quartet, the Mellowmen. I wonder if you have Thurl recordings in your collection? According to Tony the Tiger "It's Great!!!!" I have at least one--it's a Stuart Hamblen side. "Cowboy Sunday School" comes to mind (for the group), though I don't remember the title. Isn't he on Rosemary Clooney's version of "This Ole House"? Yes, Lee, you're right - it was Thurl Ravenscroft on "This Ole House". I think he was also on Rosie's "Where Will The Dimple Be?". I think I'm hearing him right now--I'm playing Cathy Johnson's "Rockin' and Yodelin'," from 1955. I Googled it, but nothing about Thurl being on it.